- photo by Battalion Chief Nate Middlebrooks. Chattanooga firefighters had to climb 150 feet to extinguish a fire at a flour mill off Amnicola Highway on Monday morning. Fire crews arriving on the scene could see light smoke coming from a vent on the upper half of the tall structure. Firefighters set up a 109-foot aerial to gain access to the lowest roof of the building. From there, another 200 feet of hose was deployed 50 feet up to the next landing and into the building. Fire personnel worked on cat walks and in small spaces to flush water through a maze of pipes and containers to extinguish a smoldering fire. 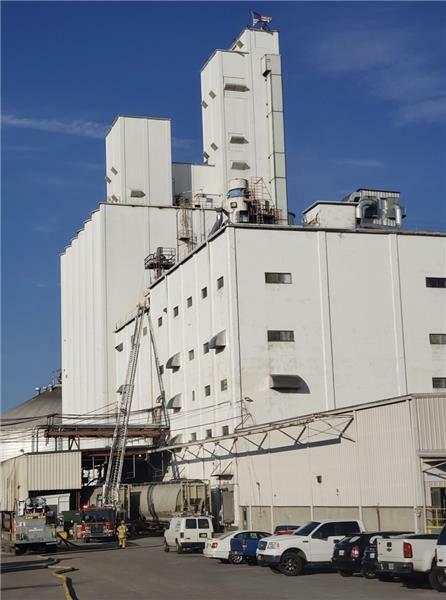 The large volume of potentially explosive flour dust in the mill, especially in confined spaces, makes any fire an extremely hazardous situation, fire officials said. Thousands of gallons of water were used until there was no more smoke coming from the machinery. No estimate on damage was immediately available. 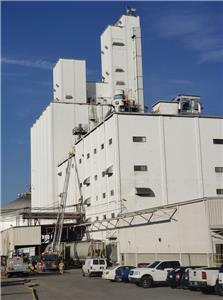 The mill will resume operation after the machinery is thoroughly cleaned.